A few decades ago, the Central American country of Belize, formerly British Hondurans, was virtually unknown. A small number of scuba divers started visiting in the 1960s, but not in large numbers. In the last five years or so, Belize has become a retirement destination and has rapidly growing tourism numbers. In 2014, Belize saw a staggering 1.2 million tourist visiting this small country in Central America, that is almost four tourist for every resident. While the complete numbers for 2015 have not been released yet, estimates are looking at a 15% increase. Although these figures can be deceiving. The 1.2 million tourist includes over 900,000 cruise ship passengers, and only about 300,000 visitors are what is called overnight guests. More than half of the overnight guest are scuba divers. The cruise ship tourists seldom wonder far from the ships ports, so the Caribbean sea is there for just that small number of divers. Most Divers are attracted to the area because of the Belize Barrier Reef. The barrier system offers world renowned diving with clear warm waters and a range of dive conditions that will fit anyone from a beginner to an expert diver. The Belize Barrier Reef is a 300-kilometer (190 miles) barrier reef making it the second longest barrier reef in the world, behind the Great Barrier Reef of Australia. In an 1842 scientific study, “Origin and evolution of coral reefs" Charles Darwin referred to the Belize Barrier Reef as “The Most Remarkable Reef in the West Indies". Jacques-Yves Cousteau's television series “The Undersea World of Jacques Cousteau” (1968–1976) featured the Belize Blue Hole in their March 1971 episode Secrets of the Sunken Caves. Cousteau declared the Great Blue Hole as one of the top ten dive sites in the world. Not much has changed diving condition wise since those endorsements. Like the GBR, A portion of the reef is a UNESCO World Heritage site. The Belize Barrier Reef Reserve System was designated as a UNESCO World Heritage Site in 1996. The site is made up of seven marine reserves and covers about 12% of the total reef. The coral reef reaches to just 300 meters (980 ft) offshore at its closest point and 40 kilometers (25 mi) at its greatest distance. This compact space means that the three different types of reef completing the whole reef system - Barrier, Fringing, and Atoll - are closer together. The unique structure guarantees a dive experience not likely to be found anywhere else in the world especially when you know that Belize is the home of 3 out of 4 known coral atolls outside the Indo-Pacific region. Belize allows divers to drift dive along deep drop-offs in the morning and to dive the shallow reefs in the afternoon. As for the number of islands and Caye's, how many can you dive in a week? It does not matter if you can not experience them all they are all amazing. Once you step back from the scientific measurements of the reef, many divers find that diving Belize is the best experience of their diving life. You will find the different coral reefs have all of the various Caribbean species you would expect to see. Macro photographers and small critter lovers will have dive sites to explore that cater to their needs. Divers that love the big stuff will have a range of shark and ray species around them on just about every dive. As the deep water beyond the barrier reefs is so close, you will see a larger number of pelagic on most sites. When is the best time to go diving in Belize? Belize can be a little confusing when it comes to talking about seasons. The "high season" for tourism is from November until April. This roughly corresponds to the Dry season from November to June. While in most parts of the Caribbean high season aligns with the US summer season plus spring break, in Belize the tourist are escaping the cold weather. The "low season" is from May through October, with the wet season, also called the green season, of June through October. While the "official" hurricane season runs from June to mid- November, Belize sees this season between August and October. Check out this infographic: Where to find the best scuba dive sites in Belize? Since Belize lies outside of the traditional “hurricane belt”, Belize has a lower number of hurricanes compared to the area to the north. During the green season, rain is not constant, so it is not very likely to have a severe impact on your travels. There is little difference in the quality of the diving year round. Most dive operators will tell you the best time to come to dive Belize between March and May. 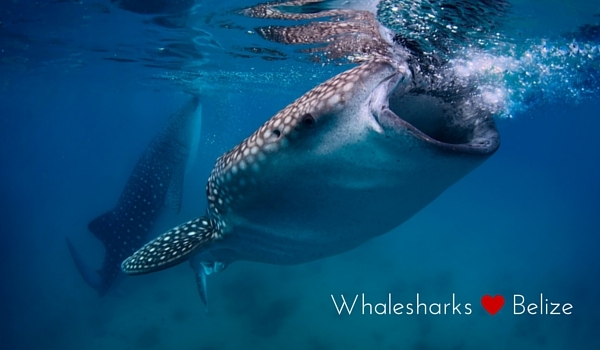 This is also whale shark season. The rainy season seldom has consecutive days of bad weather and the rain has little impact on visibility. However, the boat rides might be a bit rough due to choppy seas. 18 shark and ray species including Manta Rays, Eagle Rays, Bull sharks, Black tips, nurse sharks, tiger sharks and whale sharks (March to June). While scuba diving is a major draw for tourists, many guests come for different reasons. Belize offers a broad range of ancient Maya cultural sites to explore, caves and tubing locations as well as treks to the jungles. An adventurous traveler could spend months exploring these non-diving related activities. Many international airlines fly into and out of the Belize International Airport (airport code BZE), formally Phillip Goldson International Airport (PGIA), connecting to other destination by their hubs. Some of the listed airlines provide seasonal service only, and others may reduce frequency in the low season. America Airlines flies direct to Belize City from Los Angeles, California, Miami Florida, and Dallas Texas. In low season, the LA flight stops in Dallas. AA also flies direct to Charlotte in North Carolina that alternates with a Cancun to Charlotte schedule using the same flight number picking up the US Air route that they merged with. Avianca (formerly known a TACA Airlines) flies from San Salvador, from where you can get a connecting flight to Belize. Delta flies to Belize from their Atlanta Georgia hub providing worldwide connections. It also has a seasonal connection with Los Angeles California. The low-cost carrier Southwest has recently started service to Belize City from their Houston Texas hub. United Airlines provides flights to Belize from three of their regional hubs: Chicago, Illinois, Houston Texas, and Newark New Jersey. Newark is considered a New York City airport but transfers to the other New York airports is time-consuming. When you are planning to fly into Belize from other parts of Central America like, Cancun, Guatemala, Roatan, San Pedro Sula or Merida, tropic air should be your first choice. Tropic Air grew to become the largest airline in Belize with more than 300 staff member who facilitate offer over 200 daily scheduled flights from, to and in Belize. Planning a scuba trip to Belize? Then you should download the ultimate scuba dive checklist just like 5000+ other divers already so you will not forget to bring anything. Feel free to contact us. We have multiple partners that offer dive packages + accommodation and scuba lessons. Article written by Rutger Thole who is an avid scuba diver and loves to travel, dive and write about scuba diving. Based in Amsterdam, he runs bookyourdive.com and at least twice a year he plans a dive trip to the beaten track.